Open up wine! Linda's comin in! The idea came from being obsessed with Bob's Burgers since the first episode came out! (Human flesh mwahahaha) I run a wine blog called the Whimsical Wine Woman and like keeping it whimsical and fun! 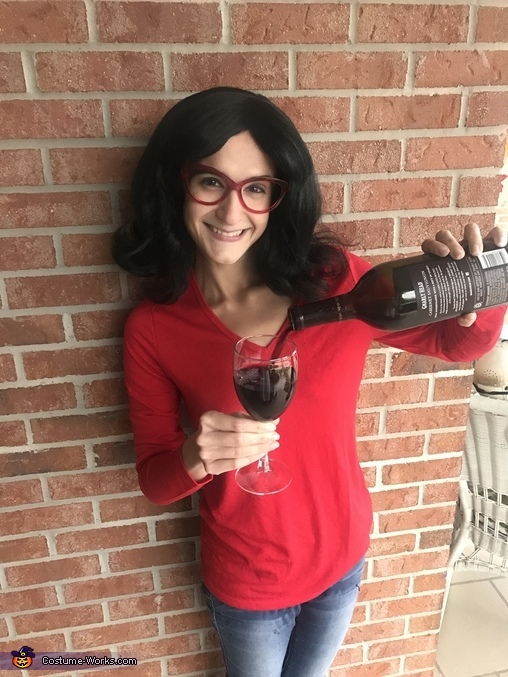 Who the heck else is more whimsical, fun, and obsessed with wine more than Linda Belcher?! I myself am wearing the Linda Belcher inspired costume! Of course a Linda Costume wouldn't be complete without her hubby Bob by her side! My boyfriend is such a good team player! Most everything is made from items we already had around the house minus the wig/glasses! I actually found the glasses at a thrift shop. Bob Costume requires grey sweat pants, a white t shirt, a white apron and a fake mustach! Linda costume requires a red v neck, jeans, "mom shoes," a black flick up wig, and red rimmed glasses!